The brain is the most complex organ in the human body. Although it represents only 2% of our body weight, it works very hard every day and it alone consumes 20% of our body’s energy. Interpreting feelings, generating thought, storing memories and controlling the body’s movements are a few examples of the many complex tasks that the brain does well. It helps us to perceive and discover the world around us. Unfortunately, some diseases can a ect our brains, like Alzheimer’s disease. This condition may have serious repercussions and a ect the quality of life of those a icted as well as those around them. 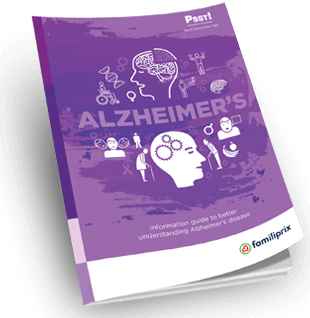 This guide has been designed to help you understand this disease better, to learn to live with its constraints and to equip people a ected by it as well as their loved ones.